Project: This study assessed the effectiveness of the Living Life to the Full Classes in the community, delivered by the charity Action on Depression. Target group: Adults aged over 18, recruited from the community (adverts placed in Metro) and posters and web adverts. Intervention: LLTTF classes delivered either immediately (Immediate access) or delayed (Delayed access arm), with follow-up at 6 months. Support offered: Classes delivered by the charity Action on Depression, with weekly sessions over 8 weeks. Outcomes: Depression, anxiety and social function were monitored at 6 months to investigate whether the intervention was cost effective and useful to attendees. Individuals aged 16+ years and who had at least symptoms of mild depression attended the classes. The Patient Health Questionnaire (PHQ-9) was used to monitor symptoms of depression. 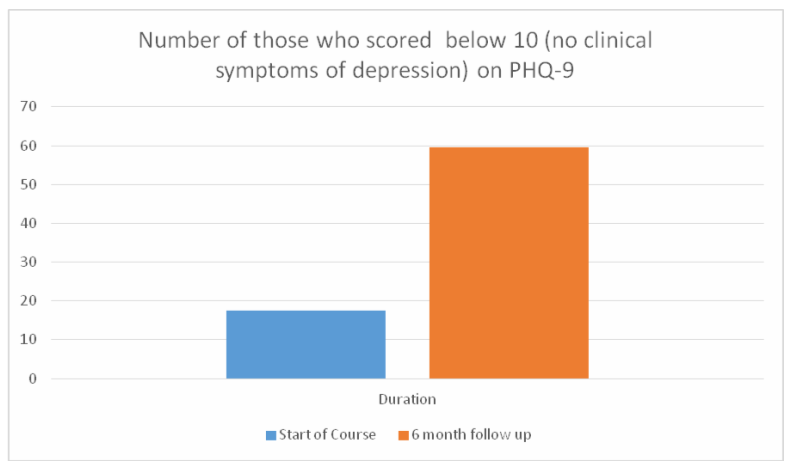 At 6 month follow-up 59.6% of those who attended the course scored below 10 (a score of 10 or below meaning no clinical symptoms of depression) compared with 17.4% at the start of the course. Significant improvements were also found for symptoms of anxiety and social functioning. The course was shown to be effective and significantly improved depression and anxiety. What else? A health economic evaluation found the intervention to be cost-effective as well as effective.